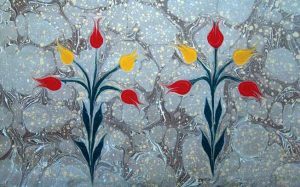 Tulips were very popular flowers in Ottoman Empire. . Tulip-mania started in Europe during 16th century when Ottoman Emperor Suleyman The Magnificent sent some tulip seeds to Europe. 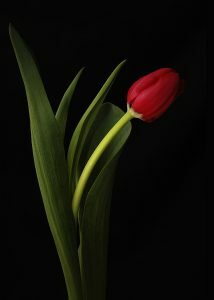 Tulip had given its name to an era by the Ottoman History. The era between 1718 and 1730 is remembered as “ Lale Devri” (in English Tulip Era). Another important point : When tulip is written in Arabic letters ( ﻻ ﻟﻪ) it covers all letters of the word of Allah (God) ( ﷲ ) in Arabic language. The equivalent of the letters according to the Abjad numeral system* the word Allah and tulip words show the same number ( 66 ). When the word tulip is read from reverse you read the word Hilal (crescent) that is the symbol of Ottoman Empire and Islam. According to the Abjad system means also the word Hilal and 66 that is the value of the word Allah and tulip. 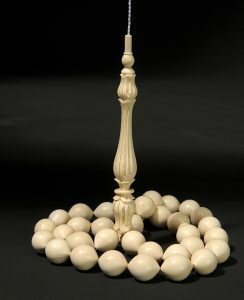 Therefore for skilful craftsmen; tulips became spiritual and religious items instead of beautiful figures of art. * The Abjad numerals are decimal systems in which the 28 letters of Arabic Alphabet are assigned numerical values.